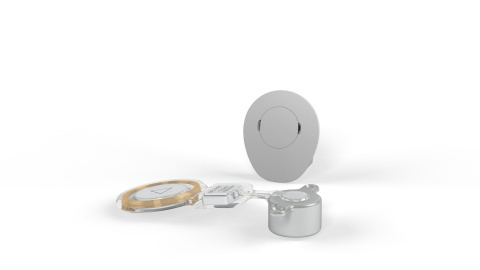 MED-EL USA announced today that the U.S. Food and Drug Administration (FDA) has granted de novo clearance for the BONEBRIDGE™ bone conduction hearing implant system for individuals 12 years and older who have been diagnosed with conductive hearing loss, mixed hearing loss, or single-sided deafness. Since its introduction in Europe in 2012, BONEBRIDGE remains the world’s first and only active bone conduction hearing implant, and is widely considered a breakthrough in bone conduction technology. BONEBRIDGE consists of two components: the internal BCI 601 implant, and the sleek, award-winning SAMBA audio processor, which can be worn discretely beneath the hair. Unlike bone anchored hearing aids with an abutment that protrudes through the skin and requires lifelong medical treatment and maintenance, BONEBRIDGE offers intact skin technology. As the implant is placed completely underneath the skin and the audio processor places minimal pressure on the skin, BONEBRIDGE recipients enjoy a low complication rate. Sound in the environment is captured by BONEBRIDGE’s audio processor, the SAMBA, and is converted into signals which are transferred through the skin to the implant. The implant converts the signal into mechanical vibrations that are transferred directly to the bone of the skull. The bone then conducts these vibrations to the inner ear where they are interpreted as sound, converted into nerve signals and transmitted to the auditory nerve. This process bypasses the non-functioning outer and middle ear, where conductive or mixed hearing loss occurs. The SAMBA audio processor is equipped with adaptive directional microphones that automatically identify and minimize noise interference. This feature is particularly helpful in situations where there is loud background noise, such as in a restaurant. The Speech Tracking feature enables SAMBA to automatically recognize the direction from which speech is coming and makes the corresponding adjustment to the directionality of the microphone. With the SAMBA remote control, recipients can select one of five programs, each with its own individual settings, for particular situations such as a noisy environment or for television and music. SAMBA processors may be individualized with more than 20 interchangeable color and design covers. MED-EL USA anticipates that BONEBRIDGE will be available in 2018. For more information about the BONEBRIDGE system, visit www.medel.com, or call (888) MED-EL-CI (633-3524). Conductive hearing loss is caused by problems with the ear canal, ear drum, or middle ear and its tiny bones (the malleus, incus, and stapes). Causes of conductive hearing loss include congenital absence of the ear canal or failure of the ear canal to be open at birth, and congenital absence, malformation, or dysfunction of the middle ear structures. Conductive hearing loss can also be caused by infection, tumors, middle ear fluid from infection or Eustachian tube dysfunction, a foreign body, trauma (as in a skull fracture), and otosclerosis.1 Mixed hearing loss is a combination of a sensorineural and conductive hearing loss. It results from problems in both the inner and outer or middle ear. Single-sided deafness (SSD) is a condition of profound unilateral sensorineural hearing loss, with normal hearing in the better hearing ear. SSD is a severe impairment that makes it hard to understand speech and sounds especially in noisy environments, as well as causes difficulties in determining the direction of a sound's location. 1 Hearing Loss Association of America. Types, Causes and Treatment. Accessed April 26, 2018.